FROM THE LAB: Subscribe to our Youtube Channel!!! This week, we are examining the amazing Ornament & Crime module, an elegant, open source, DIY build. Designed by Max Stadler (aka mxmxmx), Patrick Dowling (aka pld) and Tim Churches (aka bennelong.bicyclist), Ornament & Crime is packed with interesting, quirky functions. One of the many complex apps in the module is a quad envelope generator coupled with a Euclidean rhythm sequencer, a mode called Piqued. Naturally, this required immediate study. It was Churches (who designed the complex and wonderful Bees in the Trees alternate firmware for Mutable Instruments Braids) who brought the module to my attention. In fact, Ornament & Crime is reminiscent of scattered Mutable module functionality, including bits of Peaks, Frames, Braids and more. A number of complex (if not esoteric) modes are included in the module, ranging from vector based chord sequencing to frequency quantizing to pingpong and quadrature LFOs. But what immediately caught my attention was Piqued mode, the 4 channel customizable envelope and Euclidean rhythm generator; Mutable Peaks on steroids. One element of the O&C is obvious from the start in this mode, the gorgeous GUI used to customize the envelope shapes and settings. The visual representation of the envelopes is extremely handy and flexible. This mode and the Euclidean functionality is a step up from other sequencers, sending envelope signals rather than gates or triggers. Short envelopes can be used to trigger drum modules and clocks, but these signals can be routed directly to VCAs for more expressive performance as well. Another critical element that makes this module special are the assignable CV inputs, which can be routed to modulate any envelope stage length, Euclidean parameter or trigger delay. Using a stored voltage source like Pressure Points, direct currents can be used to set specific values for the sequencer, leading to complex and broken rhythms. With other variable modulation sources, things could get very interesting (and potentially chaotic) quickly. Keep in mind, we are still talking about only one of the many modes in the module. 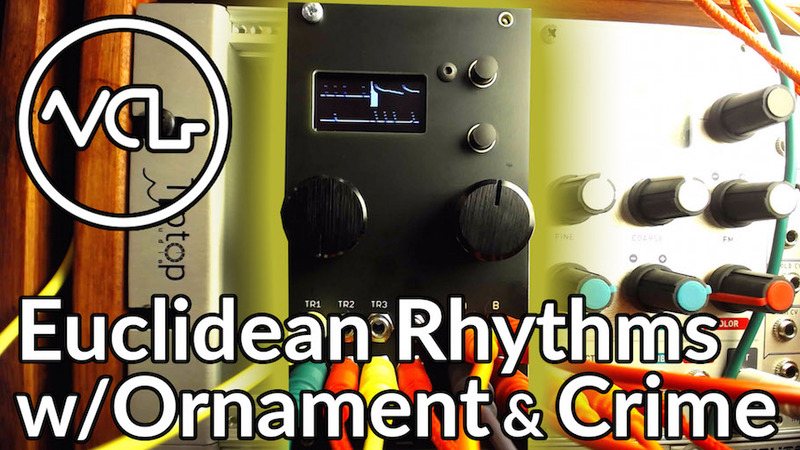 How are you generating Euclidean Rhythms? Let us know in the comments! I wasn’t ware it was available pre-built – are you sure about this? Was pretty sure it was available as SMD pcbs only, panels often sold separate. Don’t want to give folks the wrong idea.